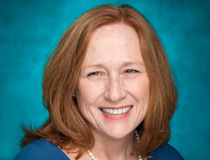 Susan Sinclair, a professor of clinical research in the UNCW School of Nursing, has won the 2018 Board of Governors Award for Excellence in Teaching. 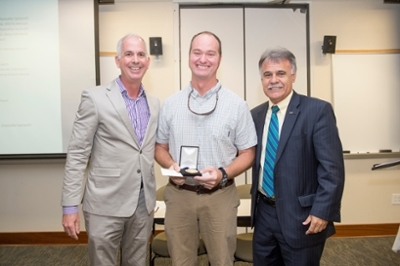 The prestigious award is presented annually to an outstanding faculty member at each of the 17 institutions of the University of North Carolina System. Sinclair’s recognition was announced during the Spring Faculty Meeting April 4. 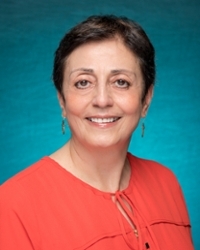 The UNCW Faculty Senate also acknowledged three colleagues who received prestigious awards in 2017: Sally MacKain, recipient of the 2017 Board of Trustees Distinguished Teaching Excellence Award; and the two recipients of the 2017 Distinguished Faculty Scholar Awards, education professor Mahnaz Moallem and Ralph Mead, professor of chemistry and biochemistry. Moallem and Reed are members of the university’s Million Dollar Club based on sponsored research. The three presented brief overviews of their research, and MacKain emphasized the role of faculty as teachers. Teaching requires involving students in their education, MacKain said, something she learned while conducting research involving schizophrenia patients before she joined the UNCW faculty. The Faculty Senate also recognized nine retirees and 14 employees who are entering or completing phased retirement. Sinclair, a scholar, gifted educator, mentor and leader in the College of Health and Human Services, has received the UNCW Discere Aude Mentoring Award (2009); the Award for Innovative Excellence in Teaching, Learning and Technology from the International Conference on College Teaching and Learning (2010); and the UNCW Chancellor's Teaching Excellence Award (2017). 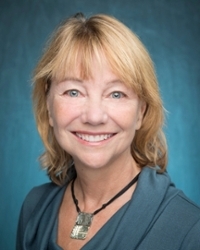 She was recently elected as a Distinguished Fellow in the Nursing Academy of the National Academies of Practice in recognition of her interprofessional teaching and research. Sinclair teaches within three programs – undergraduate and graduate clinical research and doctor of nursing practice – and has played a role in the growth of the undergraduate clinical research program. She believes student learning is the successful combination of foundational knowledge with curiosity and motivation. Since joining UNCW in 2006, Sinclair has designed and implemented two major curriculum revisions including the development and revision of the clinical research minor and a new graduate certificate program in clinical research operations. Sinclair is a principal investigator for a $390,000 grant from the North Carolina Community Foundation for the development of FUSECR (Center for Clinical Research Workforce Development). The initiative is designed to leverage knowledge and resources from the clinical research industry in southeastern North Carolina. An open house for the center, located adjacent to the UNCW Center for Innovation and Entrepreneurship, is slated for April 11 at 5:30 p.m.
Sinclair earned a bachelor’s degree in nursing from East Carolina University and a master’s degree in public health in environmental sciences from Columbia University. She received her Ph.D. in epidemiology from UNC Chapel Hill. Recipients of the Award for Excellence in Teaching are selected based on nominations from their home campuses. Each winner receives a commemorative bronze medallion and a $12,500 cash prize.